Turn left when you enter Butler Elementary School in Avon, and you walk along what used to be a long blank wall that students invariably dragged their hands across as they went to and from lunch – leaving behind grubby handprints and smears of food. A detail of the mural. The school’s 400 students in prekindergarten through sixth grade worked with Cambridge muralist David Fichter to create the artwork. Now, nobody has to remind students to keep their hands off the wall. “It’s too special,” explained sixth-grader Brigitte Alcantara. The genesis of the project occurred over the summer when Reynolds, who came to Avon four years ago from Kingston, starting thinking about ways to turn the nuisance wall into something more constructive. “We were always trying to get their hands off the wall; [I thought] we should do something to get their hands on the wall,” he said. 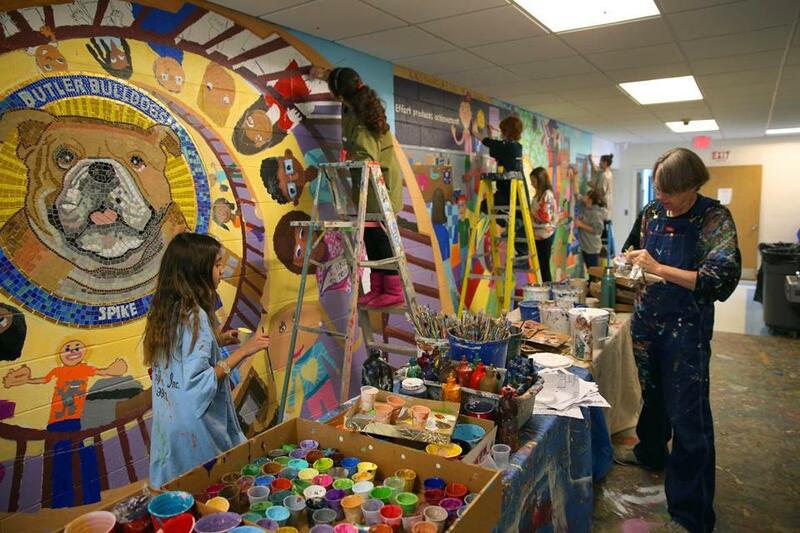 Some online research led him to Fichter, who for the past 30 years has created numerous murals inside and outside schools — many funded by the Massachusetts Cultural Council, which this school year gave $730,900 in STARS grants to schools for artist, scientist, and scholar residencies. Reynolds applied, and the Butler Elementary received a $5,000 grant in October; the school’s parent association agreed to provide $2,100 for supplies and other expenses, he said. The real work began in early November, when Fichter met with students, parents, and teachers to brainstorm ideas for the mural. The consensus was to represent what Reynolds calls the Five Principles of Learning: learning is about making connections; effort produces achievement; we learn with and through others; learning takes time; and motivation matters. Reynolds learned about the principles from a National Institute for School Leadership program and introduced it to the school. Artist David Fichter worked with the students, taking ideas from individual pictures drawn by the children at Butler Elementary. The next step was to generate images to put on the bare wall, one side of a long hallway the other side of which is punctuated with doors to the boiler room, bathrooms, and supply closet in the one-story 1963 building. Members of the school student council — consisting of fourth-, fifth-, and sixth-graders — assigned each grade a theme and went to all the classrooms to explain the project. Then every student in the school created at least one pencil drawing related to the theme. The pictures showed lots of smiling children — reading books, sitting at desks, helping one another, listening to teachers — as well as flowers, a few cats, a turtle, and lots of pictures of Spike, the school’s bulldog mascot. After talking with the students to get ideas on how to incorporate all the images, Fichter made a collage of the drawings, connecting them with overlapping and curving staircases that divide into the learning themes and meet in the center at a glass mosaic of Spike. 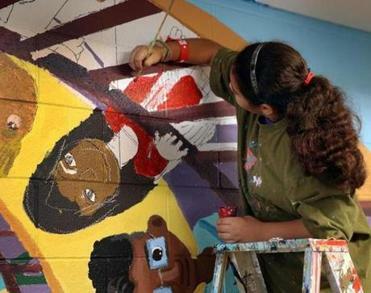 Sixth-grade student Brigitte Alcantara practices her handiwork on a portion of the wall. There’s also a mosaic of a floating girl reading a book — from a drawing by a second-grader — and mosaics of flowers growing out of a clock with hands made of a pencil and ruler. 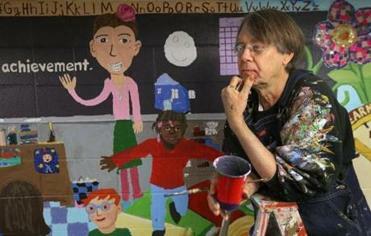 On Jan. 8, Fichter projected the design on the wall for the older students to trace with permanent marker. 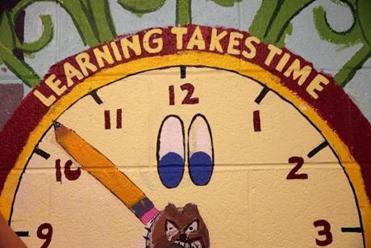 Two days later, the kids began painting during their art periods, starting with the kindergartners and continuing at 45-minute intervals until the mural was finished, two and a half weeks later. The older students made the mosaics, donning safety goggles and learning the art of clipping glass tiles and adhering them to sticky mesh. All the students painted — with taller ones called on to get on ladders to reach the top of the wall. Sixth-grader Alcantara said she was amazed at how focused the younger students were. And she said she liked how Fichter didn’t change their drawings. 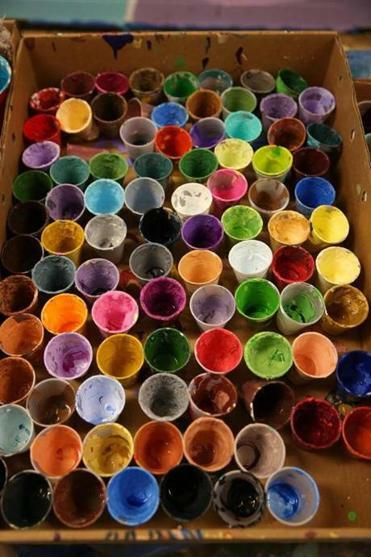 Sixth-grader Cassidy Nadeau said the students learned a lot about painting techniques and how to work together. “It was a really good experience. If I have kids, I can bring them back here and say, ‘Look what Mommy did,’ ” she said proudly. Superintendent Paul Zinni said he was pleased that the theme was chosen by students and that he got to paint a picture of a book — “which certainly is close to my heart.” He also was proud that such a big project came from such a small school district — where, because of school choice, roughly a third of the approximately 745 students come from such places as Brockton, Randolph, Stoughton, and Holbrook. “We know to really be prepared for the 21st century, our children not only need the traditional three R’s of reading, writing and ‘rithmetic, but they need to have the creativity to use those skills in new and innovative ways,” Zinni said. Butler Elementary plans to unveil its mural to the public this Thursday at a 9 a.m. ceremony that will be run by the students, Reynolds said.